When the forecast said 4-7 inches of snow in the first week of March, I knew I needed to read something to get me mentally as far as possible from this snowy, slushy mess of a city. Luckily, the audiobook of "The Vacationers" was finally available on Overdrive, and it did not disappoint. Franny and Jim are escaping the oppressive NYC summer with a two-week family vacation to Mallorca. Their children and oldest friends will join them: their 18-year-old daughter Sylvia, about to head off to college; 28-year-old son Bobby and his older girlfriend Carmen; and Franny's best friend Charles and his husband Lawrence. Each guest in the gorgeous, remote beach house brings their own emotional baggage on the trip. Not everyone is thrilled to be there, and those who are wish others weren't. Negative reviews on Goodreads claim nothing happens, but I disagree. During the two week trip, some relationships grow stronger, some are repaired, some dissolve. The book isn't about events. It's about how our relationships are shaped by the events in our lives - if and how we choose to share life's biggest moments, high and low, and with whom; how we react to the big moments of those we love (or think we love); and what our loved ones' own loved ones should mean to us. The book is not going to make your heart swell with joy or drown you in tears. But it's a solid piece of vacation escapism, with interesting characters and enough interpersonal drama to make it meaningful. Kristen Sieh's audio narration is on point and keeps things moving along as a suitably brisk pace. Verdict: Affirmed, if you know you're getting fiction a couple steps above chick lit, but not quite hitting literary masterpiece. If you're a fan of Maggie Shipstead, this is a solid novel to try. 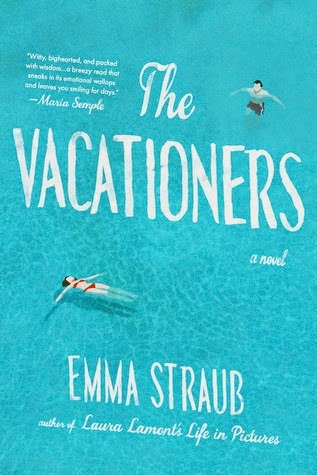 "The Vacationers" by Emma Straub, published on May 29, 2014 by Riverhead Books. Audio narration by Kristen Sieh, published on May 29, 2014 by Penguin Audio.